If you’d like to learn about storyboarding, retina images, CSS animations, and other interactions, you should check out the supplemental article on Adobe Inspire. Also, before reading further, you should definitely play with the storybook itself! My goal was simple enough: make a storybook app that worked equally well in Chrome and on iOS Safari, specifically on the iPad Retina. Mind you, I wasn’t designing for a “mobile context”, I knew exactly where my target audience would be: on wifi connections, in the comfort of their own homes, either reading with their children on their laps or dissecting the code at the office. That allowed me to worry less about browser compatibility, a luxury few in production environments can afford. But it’s important that we have projects like this that jump ahead of the curve because they help us think about what will be possible tomorrow. Art styles and character development had to be in place before I started coding. I’d always enjoyed ”Alice in Wonderland” and ”Through the Looking Glass” growing up, and I dove into researching and developing the new world and characters I’d be creating with zeal. Clear differences in art styles had to be established, from the Impressionist and sterile park of the real world to the mid-century riot of the rabbit’s hole. Each character had to have their own history and personality. Because of tight deadlines, I could only bring a small part of the of the book to life. I started by rewriting the opening scene (which you can read by turning off the CSS or printing the storybook’s page) and then creating a storyboard to go with it. Learn more about the creative process, characters and environment designs that went into “Alice in Videoland” in sister article I wrote for Adobe Inspire. From the blinking eye to Alice giving chase, animations are used subtly throughout the story to give the illusion of life, not unlike a popup book. However, while CSS animations are supported in all modern browsers, Internet Explorer 8 and below do not support them. If you’ve checked your site’s traffic reports and a significant number of your users rely on Internet Explorer 8 or earlier (you always check your analytics before designing, right? ), you can still support those browsers while offering the full interaction to modern browsers. The web development community has faced this problem before and has developed now-common technologies such as web fonts and AJAX. The solution is simple: users on modern browsers get the full experience, while those on less capable browsers still get an intelligible and useful experience. Walt Disney might have called this “plussing” the user experience. Web developers call it “progressive enhancement” or “graceful degradation,” depending on whether you build for older or newer browsers first. In newer browsers, this is a beautiful, fluid, three- dimensional animation. In older browsers, the animation jumps from state to state—from a closed letter to an open one. People in Internet Explorer 8 and lower will still be delighted by the illustration and won’t notice that it should be animated, while people in newer browsers will be entertained at the plussed animation. In Alice in Videoland, I did the same. 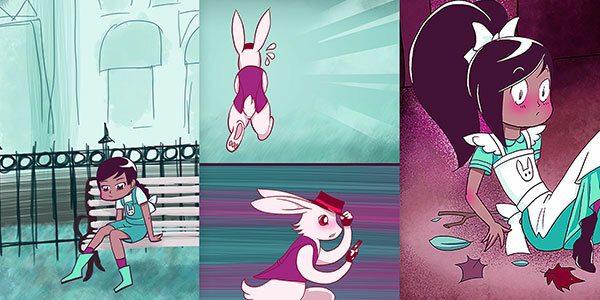 In the scene where the hipster white rabbit runs across the screen, I made him centered and stationary if he couldn’t be animated. I did this with modernizr.js. How the White Rabbit’s scene should look on browsers like IE 8 and lower that don’t support animations. Learn more about building animations and retina images in sister article I wrote for Adobe Inspire. It’s fairly easy to scope the CSS for the loading screen to the .loading and .loaded classes. Check out line 9 of the CSS in the codepen example. The padding on the container transitions to 0, causing the load screen to “roll up.” Lines 108 to 128 control the animations that cause the cup and saucer to drop after adding the .load class to their container. Then we scope the animation styles to the .in-view class so they only fire after scrolled into view. Originally I was going to animate the background behind Alice, but as the project progressed, I realized that the effect I really wanted was for her to fall toward the bottom of the screen as readers scrolled down. Readers would have to engage with the story to see what happens next, and they would be rewarded not only with a progression toward a goal (the bottom of the page), but also with changes in Alice’s mood from frightened, to curious, to sleepy. First, I had to make Alice sticky. That is, I needed to make her switch to a fixed position after the reader began scrolling, so she wouldn’t scroll off the top of the page. I did this using the handy jQuery Waypoints shortcut for sticky elements rather than trying to write my own system. Notice how Alice “jumps” with each swip of the finger. 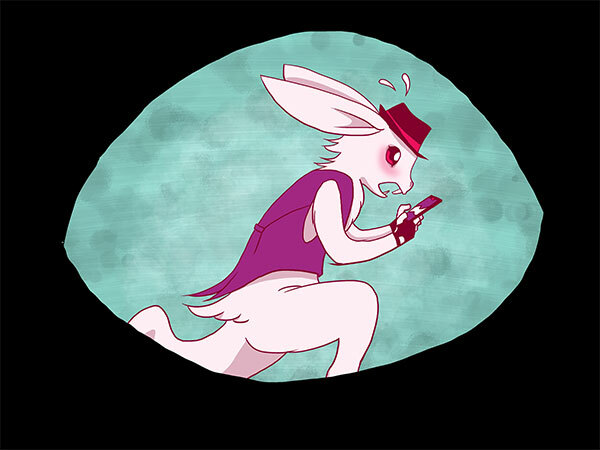 Because skrollr’s mobile “fix” doesn’t fire scroll events, Waypoints doesn’t change Alice’s moods. This is where I lost steam. I considered setting it up so the falling sequence was an animation on the iPad and a scrolling interaction on desktop, but I loathed the idea. First, I’d have to maintain two separate interactions and second, if I were animating so much of the tale, why didn’t I just make a video of it? The point of the scrolling interaction is that it pulls readers into the story; they control Alice. They are Alice. It engages them. If all they have to do is click on the rabbit hole, what is the point of that? This is a massive simplification of the code. For this touch-based use case, I had to resort to keeping track of the current, previous, and next pages using counter variables. There are also some interesting things happening with recalculating heights and such on changing environments. I highly recommend you take a look at the (helpfully annotated!) source code if you really want to get your hands dirty. One of the problems with developing for iPads is that clicks do not map directly to taps. When you tap a link in iOS Safari, there is a slight pause while the system double checks that you’re not going to make some kind of gesture. It’s asking, “Are you sure you want to follow that link? Or are you pinching or double tapping?” This makes click-based interactions feel sluggish and unnatural. Alice in Videoland will always be a work in progress for me. As time allows, I can go back to expand the number of devices and browsers she performs seamlessly in. Or I can move forward and add new chapters to the story to demonstrate things like canvas, SVG animations, or the web animation API. I’m always open to new ways to write code and make old code run faster. I hope that ”Alice” will serve as a long and storied demo of things just around the corner for interaction design.